Shiny And New: World's Largest Solar Plant Opens In California : The Two-Way The $2.2 billion, 400-megawatt Ivanpah Solar Electric Generating System will provide electricity to 140,000 homes. NRG celebrates the future of solar energy at the grand opening of the Ivanpah Solar Electric Generating System on Thursday in Nipton, Calif. The world's largest solar power plant, made up of thousands of mirrors focusing the sun's energy, has officially started operations in the Mojave Desert, just inside southeastern California near the border with Nevada. The $2.2 billion, 400-megawatt Ivanpah Solar Electric Generating System, which covers 5 square miles and has three 40-story towers where the light is focused, is a joint project by NRG Energy, Google and BrightSource Energy. The project received a $1.6 billion federal loan guarantee. The plant, which went online Thursday, is to power 140,000 homes. It was dedicated by U.S. Energy Secretary Ernest Moniz. "Unlike the photovoltaic solar panels that are common on the roofs of homes and commercial buildings, solar thermal technology concentrates the sun's rays to boil water and generate steam. 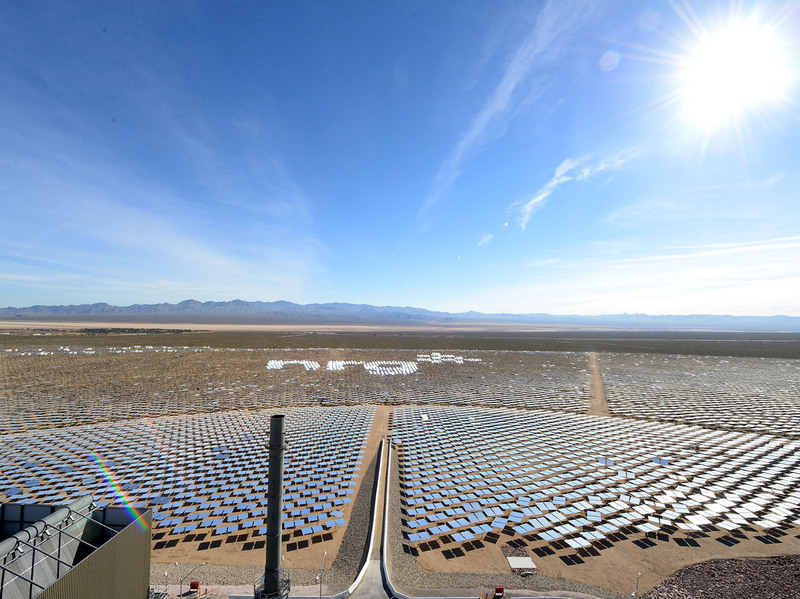 Solar thermal, also known as concentrating solar power, or CSP, is land-intensive, requires access to transmission lines and typically faces several environmental reviews and permitting hurdles before projects can be built in the desert." According to The Associated Press, "[larger] projects are on the way, but for now, Ivanpah is being described as a marker for the United States' emerging solar industry." The Wall Street Journal, however, is skeptical of the enterprise, saying Ivanpah is "the first of its kind, and may be among the last, in part because of growing evidence that the technology it uses is killing birds." "Utility-scale solar plants have come under fire for their costs — Ivanpah costs about four times as much as a conventional natural gas-fired plant but will produce far less electricity — and also for the amount of land they require." "BrightSource wants to build a second tower-based solar farm in California's Riverside County, east of Palm Springs. But the state Energy Commission in December proposed that the company instead use more conventional technologies, such as solar panels or mirrored troughs." "One reason: The BrightSource system appears to be scorching birds that fly through the intense heat surrounding the towers, which can reach 1,000 degrees Fahrenheit." Update at 8:20 a.m. ET. Site Is In California: Earlier, we said the facility is on the Nevada side of the border between the two states. In fact, it is on the California side. Our thanks to reader Alexandra Kostalas for pointing that out to us in an email. We've corrected the post. A previous version of this story incorrectly said the Ivanpah Solar Electric Generating System is in Nevada. It is in California.